Huy Pham Family Golf Tournament – DSAOC thanks you! DSAOC would like to extend a very special THANK YOU to Huy Pham and all of his family members and friends who came out to support their annual family golf tournament. Through this tournament, the group raised almost $3,500 for DSAOC! Mr. Pham works at the same company as Dr. Jensen, who has a young daughter, Sarah, with Down syndrome. 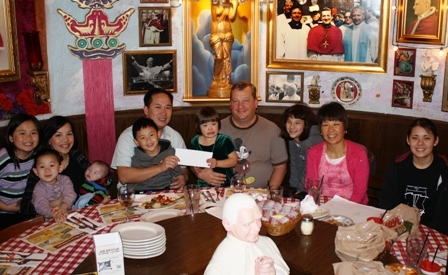 When the home location for this family event moved from Nevada to Orange County, Mr. Pham wanted to support a charity that had grown close to his heart through his relationship with the Jensen family. DSAOC was thrilled to be the benefiting charity of the Huy Pham Family Golf Tournament, and we are thankful to Mr. Pham for his desire to support the programs and services we provide to our community. This entry was posted on Wednesday, April 18th, 2012 at 4:16 pm	and is filed under Uncategorized. You can follow any responses to this entry through the RSS 2.0 feed. Both comments and pings are currently closed.